What makes Google Mobile Advertising so powerful? 30 Jan What makes Google Mobile Advertising so powerful? Mobile advertising offers advertisers the chance to get at the front of customers minds just as they are looking to buy. This is the most critical part of the consumer buyer journey and the most likely to result in a conversion. Google refers to these instances as “Micro-moments”. These special occasions represent the best opportunity for Marketers in targeting mobile devices. When someone picks up their mobile device, they are looking to learn, do, find or buy something at that very moment. These instances are called micro-moments. These moments happen constantly, and the convenience of mobile devices, particularly phones, means they are the first port-of-call for internet searchers. 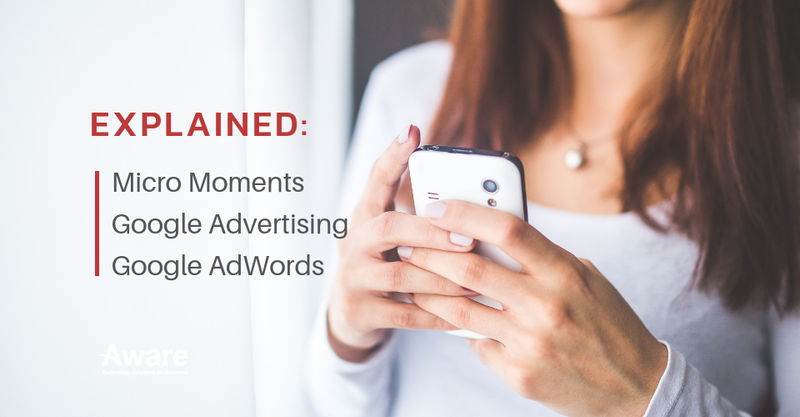 These micro-moments offer advertisers (that’s you) the chance to meet their customer’s needs. (1) I-want-to-know moments: this occurs when the consumer is not really in purchase mode, but they want useful information and can be evaluating a potential purchase. (2) I-want-to-go moments: people are looking for a local business or are considering going to a local store for a product or service. Getting your brick-and-mortar store or shop in your customer’s consideration set is critical. Note that “Near Me” searches have doubled, with 82% of users saying they use search to find local businesses. (3) I-want-buy moments: someone is ready to make a purchase and they are deciding how or what to buy. Take “Same Delivery Flower for Mum’s Birthday” as an example. (4) I-want-to-do moments: These are the “how to” moments when people want guidance or assistance when doing something new. Every mobile search provides some sort of insight about a buyer’s intent – it also gives you the ultra-powerful information and segmentation opportunities of time, location and proximity. Targeting people when they are most likely to buy is easier with Mobile advertising. There were more than 1 trillion searches in 2016. And over half were on mobile. Mobile is very much the present and future of search. Digital Marketing Manager at Aware Group: Working his way through the world of technology and Thailand as best as he can. Happy to contribute to other tech publications.